A good fence is more than a wall between neighbors. A good fence is more than a boundary marker in your neighborhood. No, a good fence is a good sense option to keeping your loved ones safe. Having a fence surround your yard is an easy way to keep your children within sight when they are out playing. It is important that children spend time outdoors running around and exploring. A fence adds peace of mind knowing that they are not going to wander away from home if you take your eyes off of them for a second. Being able to open the back door and let the dog run outside freely is heaven for any pet owner. There is no need to get dressed, find the leash, and search for an umbrella all while Fido is scratching at the door needing to go out. Your dog can enjoy the yard, no matter the weather, and you can feel secure in knowing that your loved one is not chasing the cars in the neighborhood. Unfortunately, there are some people who want to enter our homes for all of the wrong reasons. These intruders will commonly watch a home for a few days in order to learn the family’s habits before attempting to break in. Once they feel comfortable knowing the routines of the family, they will take their opportunity to enter the home. 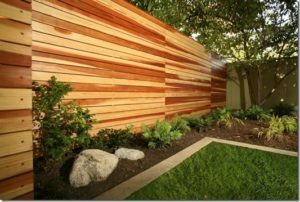 Hiring a good fence company to recommend the right fence to secure your home and property is vital. Potential intruders will think twice about breaking into a home that has a secure fence surrounding it, especially if there are other, easier, options available. Many states mandate that all pools be surrounded by a secure fence. If your state isn’t one of them, you really need to consider installing one, even if you don’t have small children. Sometimes an open pool may look like an open invitation for unwanted guests. Let the neighbors know that your pool is by invitation only by securing the area around it. This will also help to keep out the over heated bears, and other animals, who are looking to go for a swim!